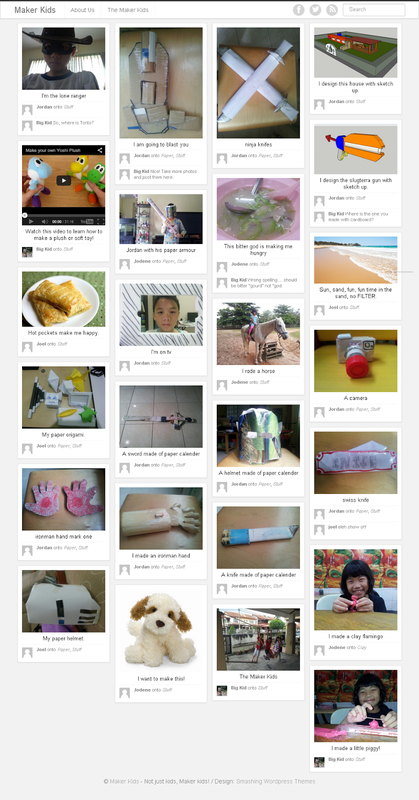 Recently, I set up a Wordpress blog for my kids to post up photos of what they made. I decided on a Pinterest-type theme as it would be easier for them to post the photos from the mobile phones and android devices using a Wordpress app. Snap photo and post. As simple as that. I also managed to get a very nice domain name for their site. Go check it out here http://jhky.org. JHKY are the initials of all my kids' name. Except for my eldest daughter, all the three younger ones have the same initials. The reason behind what I am doing is rather simple. I want my kids to be maker kids, as in kids who made things, anything! From baking to welding, I mean anything that will make them do something with their hands and involving their minds (conceptualize and visualize) end result in the end is to make something. Basically, learning the process of designing and creating something by figuring out the process on their own.